The point is if require me effort at all, it is already too much. 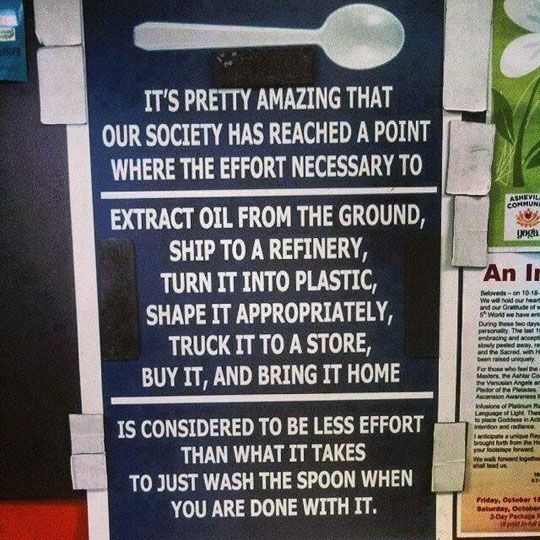 Hence the worth of plastic spoon’s existence. Are you gonna bring metal silverware when camping or going on a picnic? Seems like a hassle to bring them somewhere else to eat with them just to bring them home to wash. There is lightweight reusable camping cutlery or compostable cutlery. Cheap throwaway stuff is just wrong. Strip the bark off a pair of twigs. Viola, compostable chopsticks!